Is the Stocks Bull Market Over? Or Will There be 1 More Year like 1999? With the S&P 500 at its 50% retracement, many traders are looking for a pullback/retest. The bigger question is what happens next after the pullback/retest. Will there be 1 final leg in the bull market, like 1999? Or is the bull market already over? (The S&P fell -20% in 1998. Everyone at the time thought the bull market was over, but it kept on making new highs for 1 more year). This is a question that Jeremy Grantham’s GMO raised as well. While they recognize the probability of a “1 last bull market leg”, they think it’s more likely that the bull market is already over. *This is the problem towards the end of a bull market. No matter what kind of analysis you use, you don’t know with 100% certainty if there will be 1 last leg in the bull market or not. Anyone who tells you that they know with 100% certainty “the bull market is over” or “the bull market isn’t over” is lying. You don’t need a complicated model like GMO’s to tell you that a 1998-2000 final rally scenario is less likely. Here are some key differences between 1998 and today. For starters, the unemployment rate today is lower than where it was in 1998. The economy is more “as good as it gets”. *In September 1998 and today, the Unemployment Rate Model went to cash for 1 month, just like right now. So in this regards 1998 and today are similar. *If you haven’t read the 13.2% trading model already, please see it here. This simple model beats 95% of market commentators, most of whom can’t beat buy and hold. The Fed is hiking interest rates today, vs. cutting interest rates in 1998. A key leading sector of the economy – housing – was improving in 1998. It is deteriorating today. All in all, macro data leans towards the top already being in rather than a 1998-case. This isn’t set in stone. If macro starts to improve again, then a 1998-1999 finally rally scenario becomes more likely. Wait and watch the data. Either way, late-cycle. If you’re a long term investor, now is not the time to buy and hold. 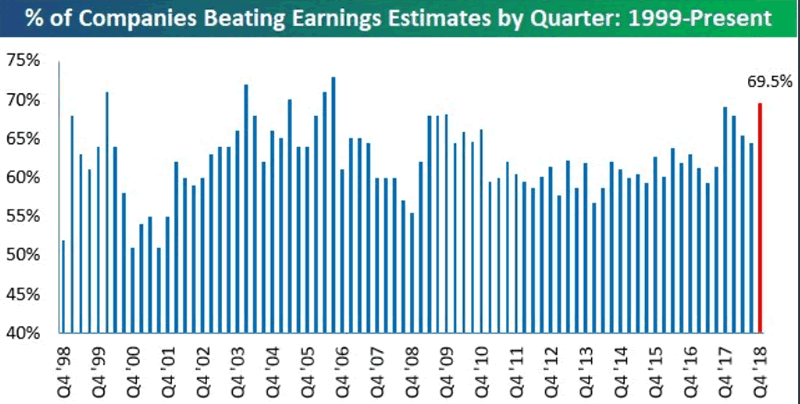 Most companies have beat their earnings estimates so far this earning season. But that was because the bar (expectations) were already set very low, making a “beat” very easy. It’s easier for companies to game earnings than revenues, due to accounting rules. While most companies beat their earnings expectations, the % of companies beating revenue expectations is quite low. On the surface this seems like a bearish sign for stocks. But when you look at the chart more closely, you can see that it’s not necessarily a bearish sign. 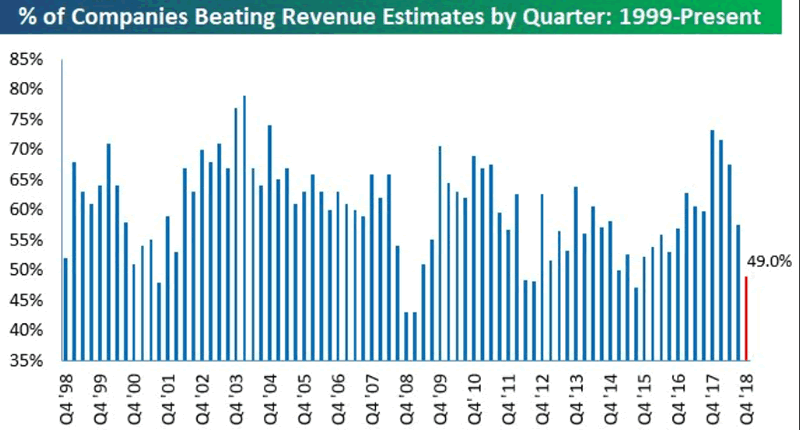 A low “% of companies that beat revenues expectations” happens in almost every 15%+ decline. In other words, this is more of a coincident indicator than a leading indicator for the stock market. 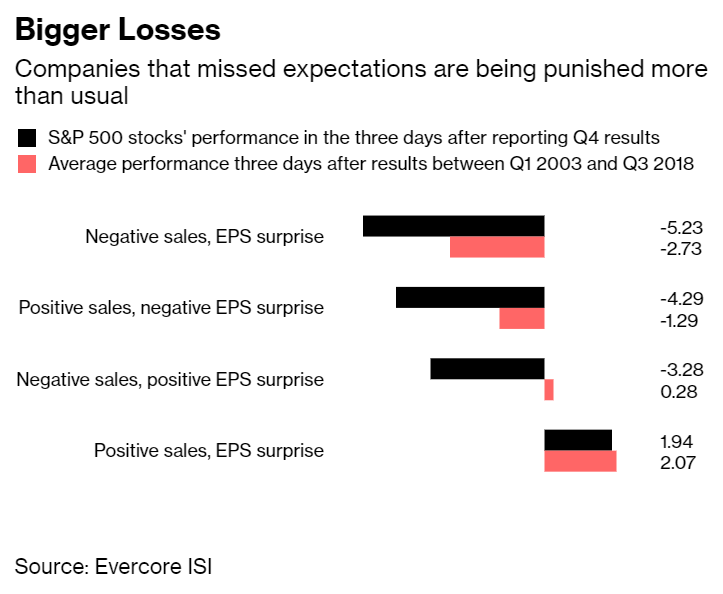 Bloomberg noted that companies that missed expectations are being punished more than usual. So if disappointing earnings are being punished more than normal, why is the broad stock market going up this earnings season? Because most stocks are still beating their earnings expectations. Last week I said that the final 3 weeks of January tend to be ok for stocks, but then stocks deteriorate after earnings season. 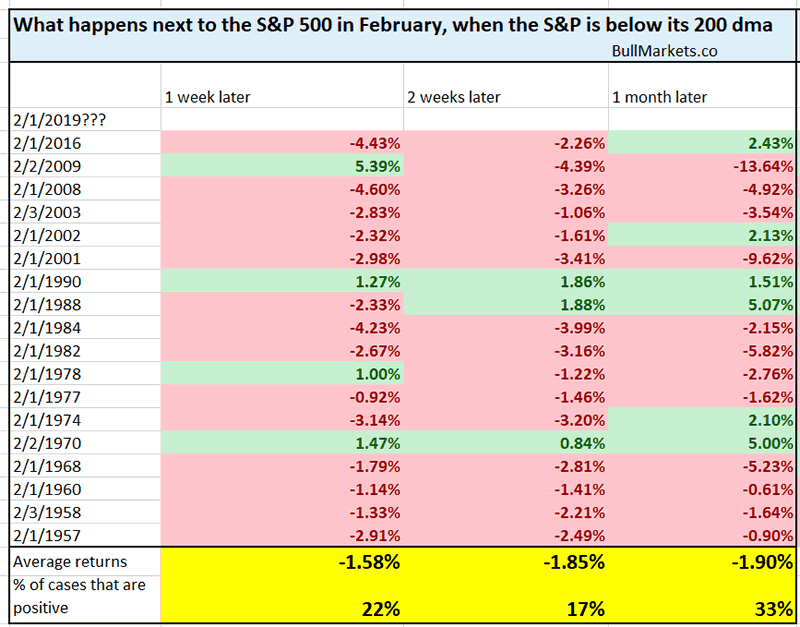 Let’s look at February (post-earnings season) more closely. 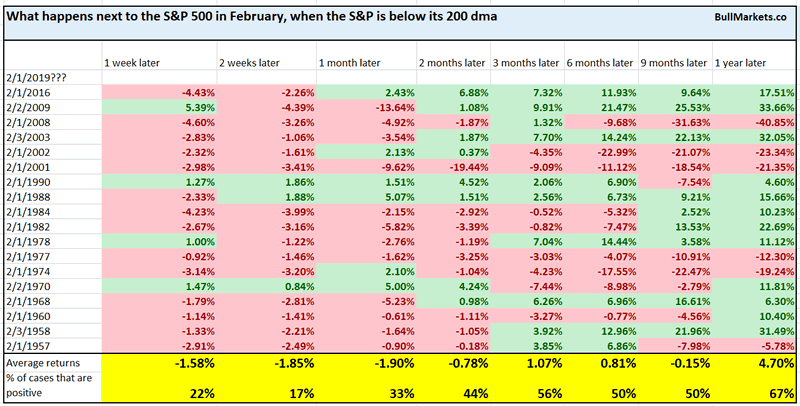 As you can see, the stock market has a heavy bearish lean in the first half of February. Absent the support of corporate earnings, stocks tend to fall in the short term. *This is what happened in February 2018. Stocks held up fine throughout earnings season in January, and then cratered in February. The Advance-Decline line is close to making new all-time highs right now even though the S&P is still more than -8% below its all-time high. Is this a bullish sign for stocks? Here’s what happens next to the S&P 500 when the S&P 500 Advance-Decline Line is within 1% of 1 year highs, while the S&P itself is more than -8% below 1 year highs. As you can see, this is quite rare, and usually marks long term inflection points in the stock market. (You can see that the 1 year forward returns are either very bullish or very bearish). In a healthy rally, the S&P 500 will go up and the XLY:XLP ratio will go up at the same time. But over the past 2 weeks, the S&P has gone up while XLY:XLP hasn’t. Is this a bearish sign for stocks? As you can see, this is not consistently bearish or bullish for stocks on any-time frame. 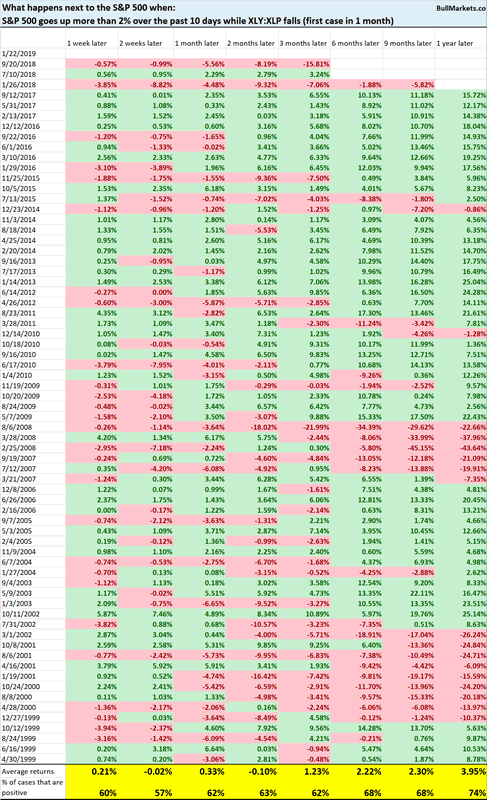 From 1962 – present, this is the first time in which the S&P went up 11 days in a row (from daily OPEN to daily CLOSE) and then fell more than -1% the next day. A simple trading model that yields 13.2% per year has turned long term bearish for the first time since 2009.